Hello loverlies! It’s the end of the fifth month of the 2013 SC! We’re almost halfway through, can you believe it? How did you all do?! Sadly, I only read one this month: I put my link in the linky widget, feel free to link add your sequel reviews for the month :) *If you have more than one to enter, just refresh the page to enter a new link. Hello loverlies! It’s the end of the fourth month of the 2013 SC! How did you all do?! I read a total of 3 sequels this month: I put my links in the linky widget, feel free to link add your sequel reviews for the month :) *If you have more than one to enter, just refresh the page to enter a new link. Hello loverlies! It’s the end of the third month of the 2013 SC! How did you all do?! Sadly I didn’t read ANY sequels this month. I know, I know. I’m slacking. 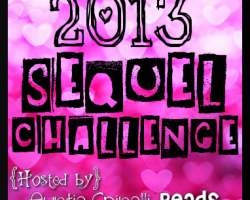 *le sigh* Here’s the linky, feel free to add your sequel review links for this month :) *If you have more than one to enter, just refresh the page to enter a new link.